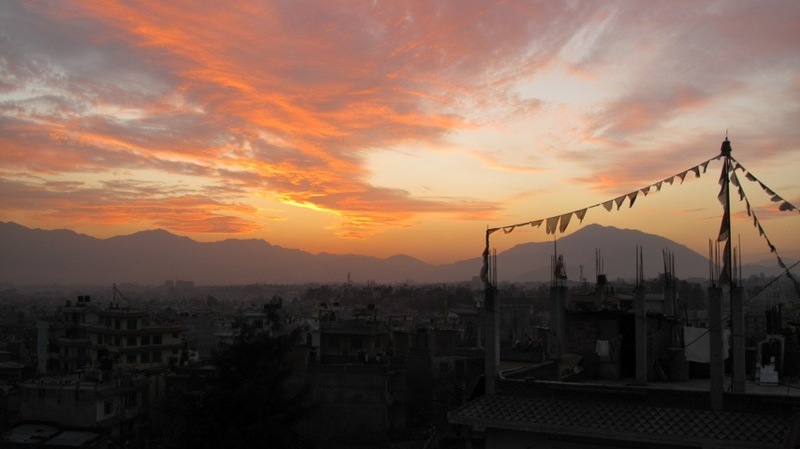 An orange sorbet sun rises high up in the Kathmandu Valley. I sip sweet milk tea in silence, and as the rounded Himalayan foothills come into view, I must internalize as I’m unable to share my thoughts with others. For a week as a temporary resident of Kopan Monastery in the northeast corner of Kathmandu, I am obliged to keep focused as a student of Tibetan Buddhism. After morning meditation at 6:30 and breakfast, I head up to Kopan’s high point. Ganesh Himal (7,000m plus) lies forbiddingly to the north. I can’t help but aspire to climb it one day, so keeping with tradition, I’m sure not to point my feet at it, especially since I am headed that direction to Langtang for two weeks. * I can hear the low rumble of Tibetan horns, cymbal crashing and deep chanting penetrating the morning’s bird chirps. This really is a sound to experience and seems as ancient as the mountains themselves. These messages are ones that I will try to keep with me for the rest of my life, even if I never officially become Buddhist (by taking refuge). With the Monlam Festival just around the corner, monks from Tibet and India have been arriving in the hundreds. The atmosphere here is one of excitement and anticipation for a week’s worth of pujas or offerings for peace and prosperity for all sentient beings. *In Tibetan and Nepali culture, not necessarily just in Buddhism, the feet are considered unclean and it is bad form to point them towards people, and bad luck to point them at things (like mountains) that command respect.